Sorry for the silence, but don’t feel too left out, it’s not just my virtual friends who have felt my silence. It’s been a socially silent time in my life as well. But I’ve missed you! I always have a running post in my head but by the time I have a minute to sit down and write I’m literally too exhausted to do anything but sleep. It’s been far more difficult returning to work than I anticipated, and I was already anticipating a lot of difficulty! I was focused on being away from Ezekiel as being the most difficult part, and that’s very true, it’s difficult and doesn’t seem to get easier. However there are other difficulties I didn’t account for. The positive of returning to work is rediscovering my love and passion for nursing. It’s one of those passions that you just want to talk and talk about and try and make everyone around you understand just how much you love it without ever feeling like you’ve accomplished your goal. I feel like I’ve temporarily lost any sense of normalcy, and balance. I’ve just been surviving the last 7 weeks but I feel as though I’m ready to get out of the survival slump and get back to feeling normal and balanced. I’m just not sure how that’s going to happen or what I need to do to get there. I don’t know that I’ll post a lot but I wanted to pop in and say hey. I hope you are all well, and that you have a very Merry Christmas and Happy New Year! Wow! I have been away for a while and I’ve missed you! It’s been a busy week, and I’ve successfully completed my first day away from Ezekiel. In short, we all had a good day – I’ll expand on my thoughts/feelings/stresses later on. For now let’s focus on how I prepared last week. Last week my parents came to visit before their departure to the US for the winter. It was so so so fantastic to have them here, and Ezekiel was over the moon. He is smitten with them and that makes my heart so happy. It goes without saying that they are equally or even more so smitten with him. So with them being here it was easy for me to keep my promise to myself. I did very minimal things (but I did learn how to hem pants thanks to my mom! ), but the day they left I went into full fledged preparation/stress mode. Honestly, preparing and organizing three people is like a full time job in itself! I spent the weekend doing laundry, cleaning the house, organizing meals, prepping Ezekiel’s food (in another post I’ll explain this), getting bottles ready, preparing my work bag and Ezekiel’s dayhome bag. I thought I’d share the food portion of my organizing. 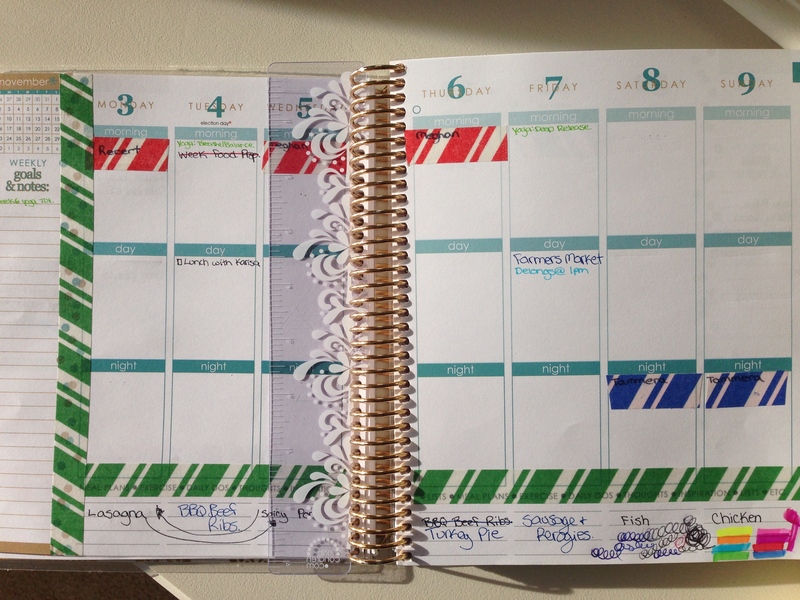 I’ve been using my Erin Condren Life Planner to plan our suppers (this week looks like a huge mess!) we are just finishing up our last bulk order of meat so it’s been hard to plan original meals! Anyways on the days I’m working I’ve planned to use our freezer meals. 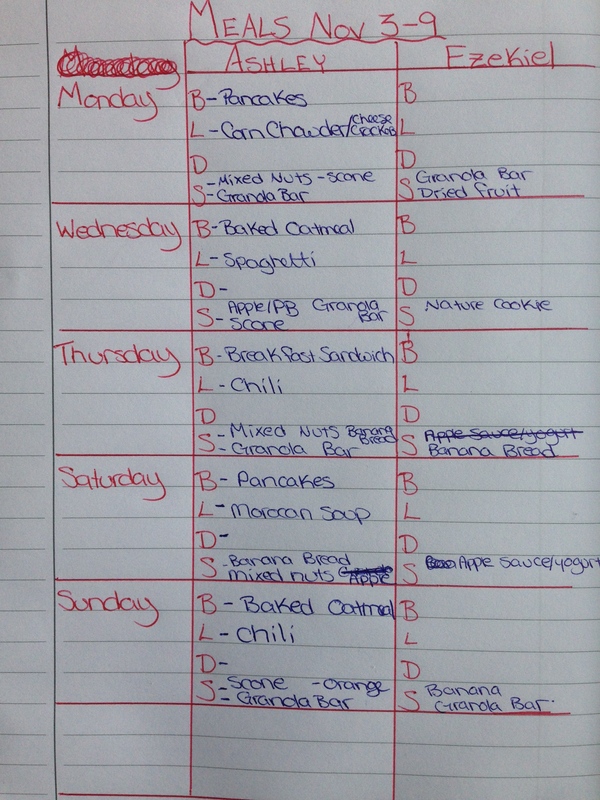 After planning our suppers I decided I needed to plan mine and Ezekiel’s full days of meals, that way I don’t have to think about food on the days I’m working. Since I work 12 hour days I have to plan every meal from breakfast to supper. We’ve had to start pureeing Ezekiel’s food again so I’ve left his blank for this week as I get used to it. For my dinners I’ll just eat what I’ve already planned for suppers at home. Snacks at work are essential to save me money and calories, otherwise I’ll be wandering to the coffee shop on my breaks and spending too much money on unnecessary things. 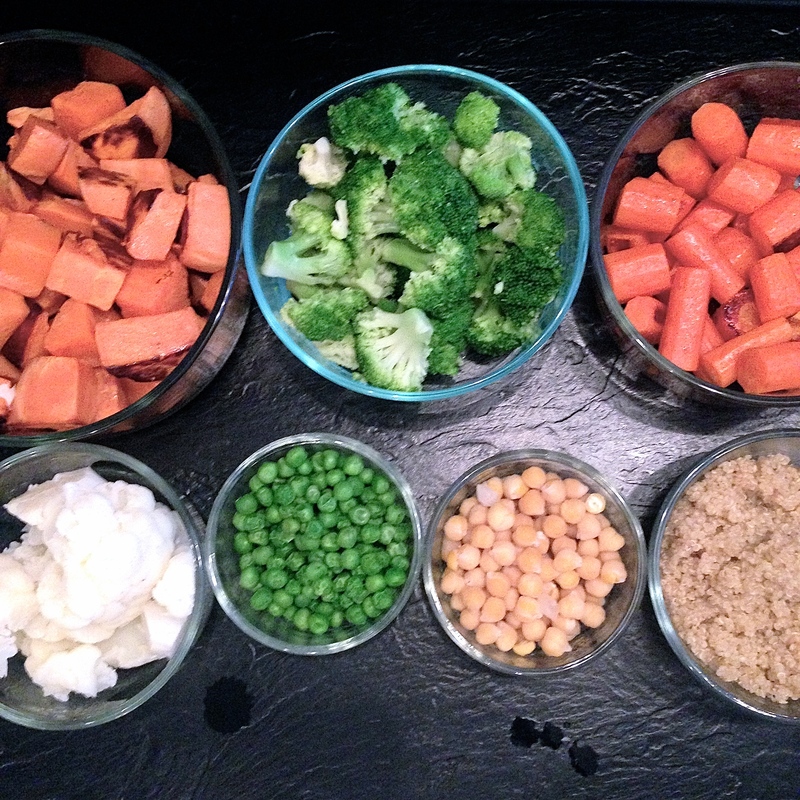 Although I didn’t plan specifics for Ezekiel’s meals I did spend Saturday morning prepping all this food for him. I mix and match for his lunches and suppers. So far he’s enjoyed each of my concoctions. It’s been great to be able to just grab the containers, and throw some stuff into the blender. I reorganized our fridge to help with the planning. The top left shelf is all of Ezekiel’s food. the top right is beverages and dairy. The middle left is yogurt and fruit. Middle right is leftovers and miscellaneous. 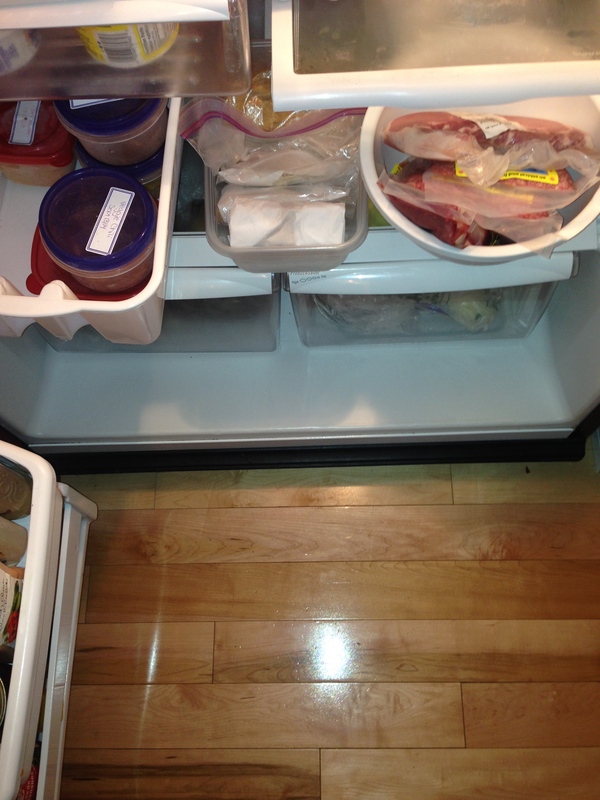 The bottom shelf I’ve placed our planned food. The left is a bin for my lunches. 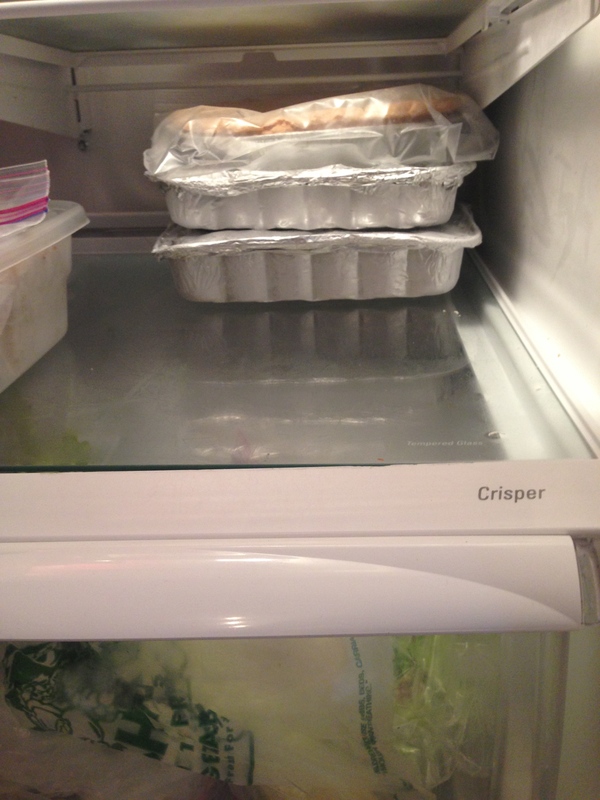 All previously frozen into individual portions, I just pull them out of the freezer and put them in the bin. 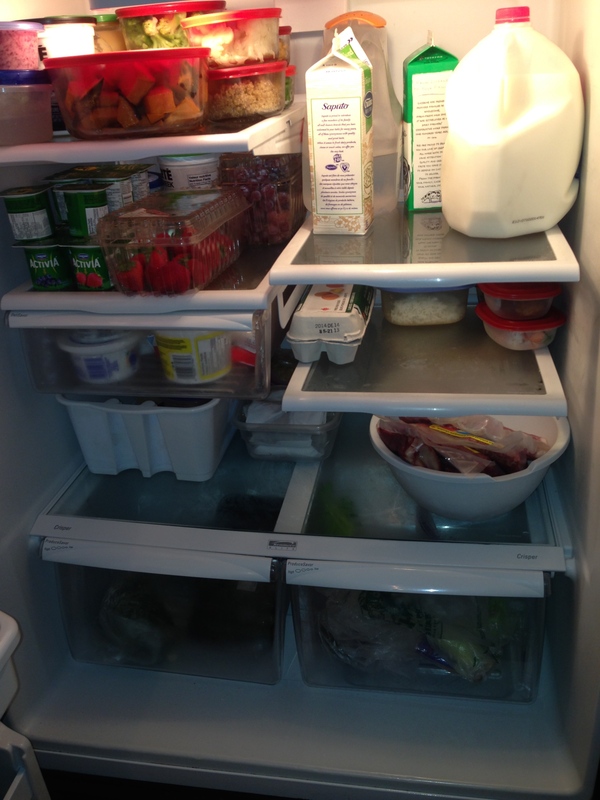 The middle is a bin for snacks I’ve prepared and frozen (granola bars/scones etc.) again I just have to pull them out of the freezer and place them in the bin. On the right is the meats I’ll be using for the week when I’m not working. I take them out of the freezer and put them in the bowl to thaw. Behind the bowl I put the freezer meals that Carlos can grab and heat for suppers when I’m working. I’ve only been back to work for a day but so far I’m loving this planning and prepping. It’s taken a lot of stress off of going back to work. The other day I was having a text conversation with a friend who is going to be done her maternity leave next week. We were talking about how crazy life felt already, even before returning to work, because we are “preparing” to return to work. She mentioned how she felt so unprepared, in that moment I told her that regardless of how prepared or “unprepared” she was, in the end everything always works out so just enjoy the last week. I’ve been thinking about that conversation these past couple days. Yesterday morning I woke up at 6 am and thought about how I should get up and have my “alone” time with my coffee and devotions early instead of when Ezekiel has his first nap so that I could be more productive during the day. I’ve always wanted to start my day before Ezekiel wakes up in the morning, but he isn’t sleeping through the night yet and I’ve always valued my sleep more. This morning was no different, I fell back asleep and Ezekiel woke me up at 8. Throughout the day I reflected on how much I’ve been stressing and preparing to go back to work, all for the sake of being less stressed and more organized when I do return but in the thick of it I’m still just focused on my tasks. I’ve gotten better at living in the moments – I spend more time on the floor reading books, playing peek-a-boo and patty cake when Ezekiel is awake and less time trying to get things done. I rock him a few minutes longer and give him an extra kiss or two, or three, or hundred 🙂 before he goes to sleep and I’m so glad for those moments. Yet in the back of my mind I’m still calculating the length of time it will take me to do x, y, and z and if it’s humanly possible to check off all my tasks on my to do list. I honestly think I will always be that way. It’s who I am. But I do think there has to be some sort of balance, or compromise. I’m taking the extra time with Ezekiel to enjoy him and invest in him and just to be with him, but I’m not taking the extra time to relax and invest in me. So I’ve made myself a promise, and they say when you make your goals public they happen more often than if you don’t. So here I am declaring that I will only stress about my back to work to do list for the next 3 weeks. The last week before I return to work is a to-do-list-free week. Monday, October 27th I will put away my to do list, I will spend every minute playing with Ezekiel or relaxing with a book and a cup of tea, maybe watch a few movies, go for long walks and whatever else my heart desires. I won’t stress about the next week because in the end everything works out anyways.